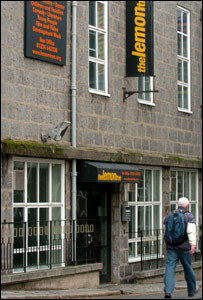 Popular Aberdeen arts venue The Lemon Tree is to go into liquidation, it has been announced. Upcoming events have been cancelled at the venue, which employs more than 50 full and part-time staff. The centre's board rejected an offer of financial aid from Aberdeen City Council, opting instead to close. The board said The Lemon Tree was unable to continue trading when it did not have enough funds to meet its liabilities. It is not known if ticket holders will be able to get refunds. Board members said in a statement: "The board met and agreed unanimously that The Lemon Tree had no alternative but to cease trading with immediate effect. "All due legal processes will be followed in proceeding to voluntary liquidation. "We regret the decision and the impact that there will inevitably be on staff and customers, particularly at this time of year, but we are unable to continue trading when we do not have enough cash to meet our liabilities." Anne Begg, the Labour MP for Aberdeen South, expressed dismay at the closure. She said: "This is Aberdeen's only mid-range Arts venue and its sudden closure is going to leave a huge hole in the Arts scene in Aberdeen. "It is a complete tragedy leaving many loyal followers with tickets for shows which will be cancelled, including primary school children hoping to see a puppet show who will find the doors firmly closed instead."